SAINT AUGUSTINE – Reservations are being accepted for the First Congregation Sons of Israel, 161 Cordova St., annual Hanukkah Celebration…Friday, Dec. 15 at 6 p.m.
Tickets include homemade latkes and raffle tickets. Gifts include a beautiful pottery kiddush cup and bowl, recipe book signed by the author, musical CD of Rabbi Joel Fox, a tallit rack, and Shabbat candle sticks. The event will be one of celebrating Hanukkah with service led by Rabbi Joel Fox and lighting of candles, traditional food, music, stories and raffle prizes. Hanukkah, or the Festival of Rededication, celebrates the rededication of the Temple in Jerusalem after its defilement by the Syrian Greeks in 164 BCE. Although it is a late addition to the Jewish liturgical calendar, the eight-day festival of Haunkkah has become a beloved and joyous holiday. It is also known as the Festival of Lights and usually takes place in December at the time of year when the days are shortest in the northern hemisphere. 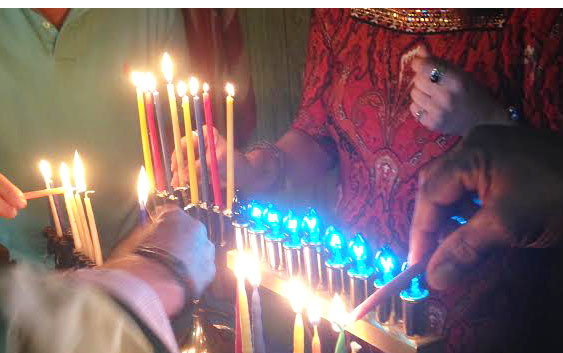 Much of the activity of Hanukkah takes place at home. Central to the holiday is the lighting of the hanukkiah or menorah, an eight-branched candelabrum to which one candle is added on each night of the holiday until it is ablaze with light on the eighth night. In commemoration of the legendary cruse of oil, it is traditional to eat foods fried in oil. The most familiar Hanukkah foods are the European potato pancakes, or latkes, and the Israeli favorite, jelly donuts. The tradition developed in Europe to give small amounts of money as well as nuts and raisins to children at this time. Under the influence of Christmas, which takes place around the same time of year, Hanukkah has evolved into the central gift-giving holiday in the Jewish calendar in the Western world. Like Passover, Hanukkah is a holiday that celebrates the liberation from oppression. It also provides a strong argument in favor of freedom of worship and religion. In spite of the human action that is commemorated, never far from the surface is the theology that the liberation was possible only thanks to the miraculous support of the Divine. Reservations required. Call 904-829-9532 or email fcsi1924@gmail.com. $10, latkes + 2 raffle tickets; $18, latkes + 10 raffle tickets; $25, latkes + 18 raffle tickets; children under 3, free. Candles will be lighted before the service. Bring a menorah and the synagogue will provide the candles.